$59.99 In stock. Order in the next 3 hours, 20 minutes and it will go out today! In stock. Order in the next 3 hours, 20 minutes and it will go out today! 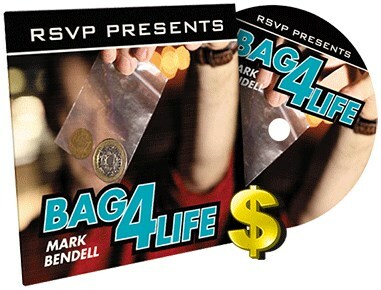 Welcome to Bag4Life, the brilliant new trick that everyone's talking about. Imagine pulling a named coin thru a clear plastic bag, inches away from a spectator's eyes! Comes with very special coin and full instructional DVD. So simple but yet so visual! Normally you don't get both of those in the same effect but you do with Bag 4 Life! It's such a wonderful moment when you see the coin melt through!